Bethesda Fountain and Terrace are considered to be the center of New York's Central Park. The interior, above, has great acoustics and a backdrop of vividly colored ceiling tiles and painted wall mosaics, flanked by intricately detailed hand painted murals. The ceiling tiles here are "Minton" tile, designed by British designer/architect Jacob Wrey Mould. These European tiles were originally designed to be used on the floors of European Cathedrals. Bethesda Terrace is the only place in the world where these tiles have been used on the ceiling! On any given day, you can find street musicians and students playing just about every type of music inside the terrace. I was surprised in design school to learn that New York's Central Park was designed architects: Frederick Law Olmsted and Calvert Vaux. Vaux was Britsh and was trained in landscape design as well. (So much of New York was borne out of European talent; the Statue of Liberty, as I am sure you all know, came from France. And the Dutch were among our first settlers to build so much of Wall Street and lower Manhattan). Vaux's designs from the 1800s were taken to another level a century later by another European Influence... a remarkable young Italian woman, Lucretia Moroni, who painted the intricately detailed frescos in 1991, when she was all of 23 years old! When I first saw these beautiful murals, I assumed they had been painted a hundred years ago. Trompe L'Oeil mural inside Bethesda Terrace, Central Park, New York. All the details you see here are paint, not sculpture. Trompe L'oeil is French for "fool the eye." Ms. Moroni studied for many years under an Italian master, and today she is one of the world's finest painters in this genre. These beautiful murals are completely accessible to the public... You can find them just by strolling around Bethesda Fountain. I would love to see Ms. Moroni come back to restore them. But I am also enjoying the patina created by the worn paint. I feel like I am in Italy or Morocco when I spend time inside the Terrace. This detail of the mural reminds me of water colors running in the rain. 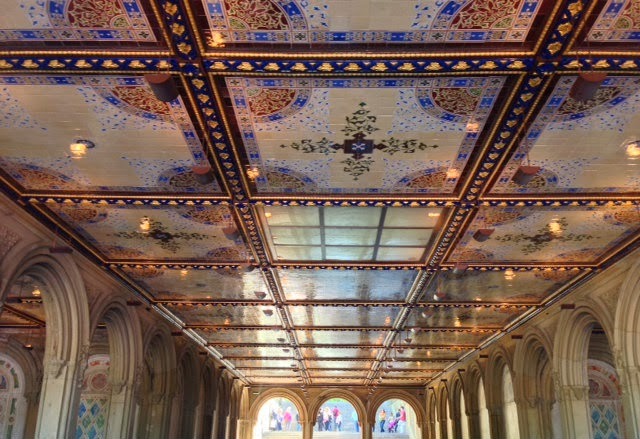 Vaux's original vision was to bring the colors of the water from Bethesda Fountain into the interior of the Terrace. A friend of mine who has only lived in this part of the United States for a few years is the one who brought me here for the first time. Isn't strange how we can live by a city our whole lives and miss such beautiful parts of it? I am now making a grand effort to see "everything" NYC has to offer. (Is that possible?) I hope you enjoy the upcoming photos that are a result of my journey. Until then, have a beautiful week exploring your world!